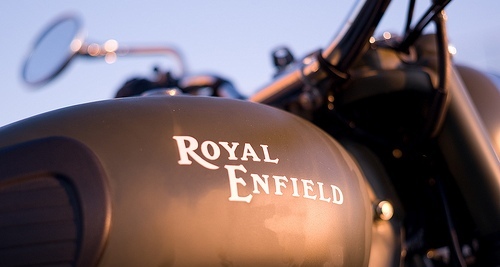 we often wonder aloud to ourselves while relaxing river-side with the elephants, a fresh yoghurt Lassi and decent serve of post-curry gulab jamun, just why there isn't more Royal Enfield-based customs around the place. After all, they are in a way a living fossil whose basic design hasn't changed since 1948. Surely this would make a perfect base for creating a motorcycle that would be pleasing to these young coffee racer-types we hear so much of? Today we were doing just that - wondering, that is - when the young tea wala broke his usual silence and pointed out to us that we had indeed received a communiqué from our good friend Vijay of the very reputable Rajputana Customs in Jaipur just this very day. "My word," I exclaimed. Then there was a long pause in proceedings where I stared into the distance, adjusted my monocle, and commanded the wala to refill my tea with a mere twitch of my eyebrow. "Well, shouldn't we read it?" Scotty interrupted. "Jolly good," I said. "Let's have at it then..."
Over to Vijay. "Vishal Mangalorkar is a 35-year-old advertising film maker from Mumbai, and I met him a month back while visiting the city. He wanted to spruce up his existing 350cc Royal Enfield and had a budget of Rs 1.5 Lakhs (about US$3000). Vishal wasn't sure what he wanted and I wasn't quite sure what I'd be able to do for him either... given the fact that he didn't want a build from scratch and had a restricted budget that wouldn't allow me to do so even if I was to convince him. Nonetheless, we chose to modify the 350 on the lines of a racer/scrambler without changing the stock frame." "To start with I lowered the front suspension and stiffened it to keep the fender from touching the neck of the bike. 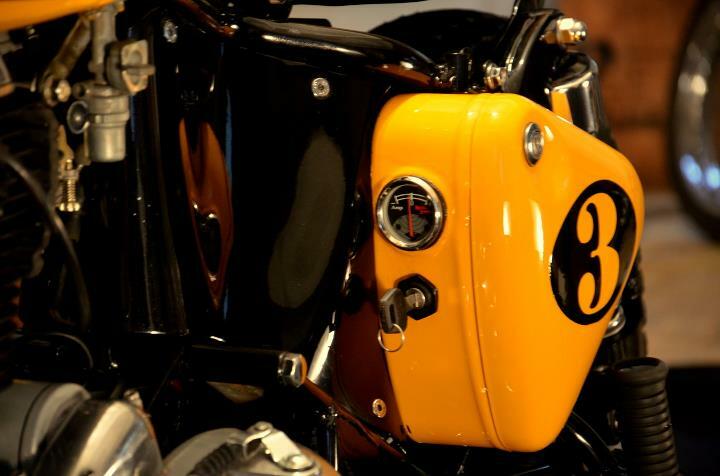 We fabricated the gas tank, tool boxes, seats, rear cowl, exhaust, handlebars, and fenders. Vishal was insistent on having a second seat for his wife who I'm guessing has the last say on all major expenses in that house hahaha... so we gave the bike a detachable rear cowl which conceals the pillion seat. The bike had to have it's main wiring harness chopped and changed big time now that we had moved the starter key and amp meter into the toolbox, replaced the front mask for a single head light, and mounted the rear indicators and brake lights under the rear cowl. 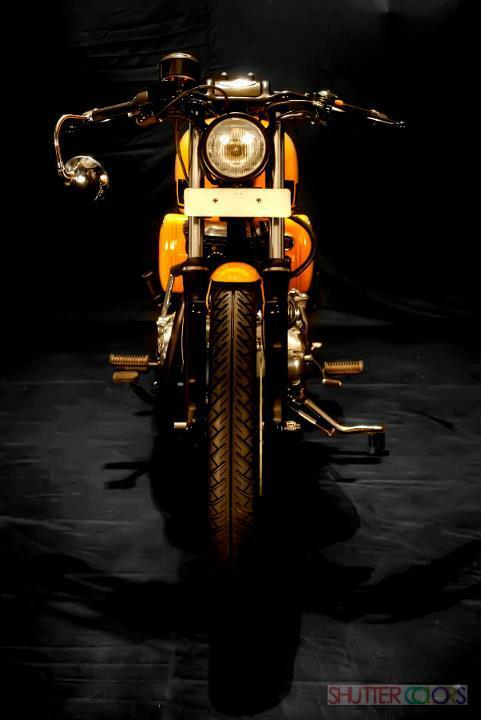 The rear tyre is a 5.00-16 Avon Speedmaster which was imported from England while the front is a stock RE 18incher. 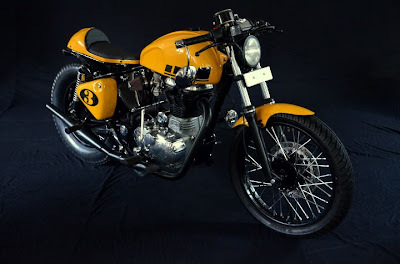 The foot-peg placement has not been changed because Vishal didn't want a very aggressive riding position, it's actually worked in our favour cause for all i know maybe we've stumbled upon a cafe racer kit for stock RE's in India having built Chingari. 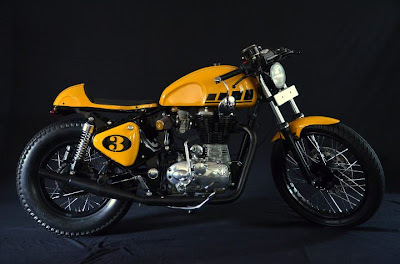 Let's see how things go in time to come but as now I've been getting a lot of serious inquires about potential cafe racer modifications to other people's Royals." "Lastly, Vishal was adamant on having the bike painted yellow 'cause it's his favourite colour, we went a step further and gave the yellow a few black lines and blocks which draw inspiration from the old school Yamaha racing colours... excluding the white of course. All round this build didn't involve half the work we usually put into a build from scratch but it was a challenge nonetheless. 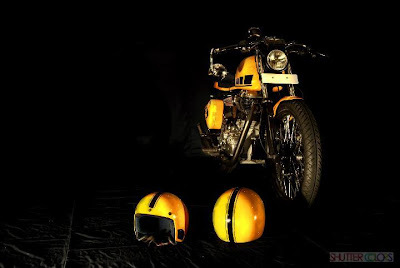 The main obstacle was to try and create something authentic and unique while still maintaining the essence of a Royal Enfield within a limited budget and we hope that we did so." 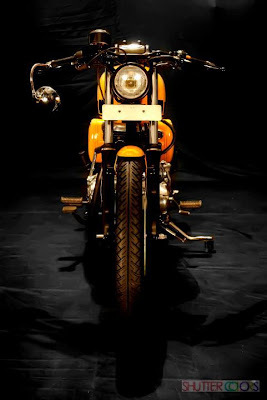 "Chingari for me is probably gonna be the start of a new genre of 'budgeted customs' wherein we don't build a bike from scratch but rather change up a few essentials to a stock bike in order to do justice to the modified finished product. Once the bike was done I decided to name her "Chingari" which in Hindi means "spark" - let's see if this little yellow spark can set off a bomb of "budgeted customs" in India. Fingers crossed. Cheers!" Great to see a custom that's not from the US, North America or Australia. 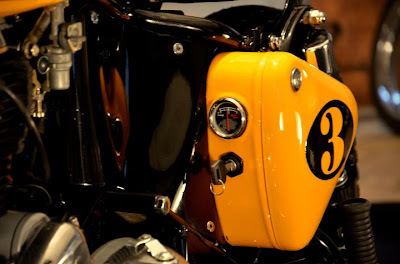 Motorcycling has always been about being an "outsider", and this bike really embodies that. Damn goooooood . . . . . . .